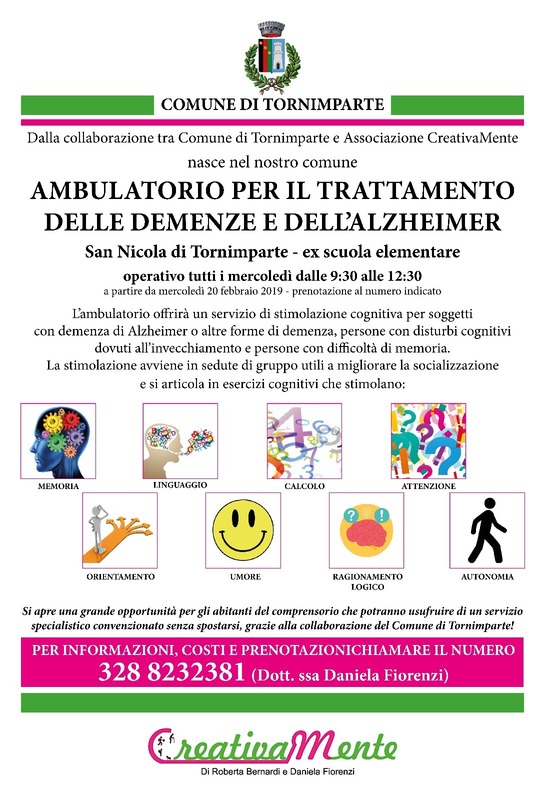 SI AVVISA LA CITTADINANZA INTERESSATA CHE DAL 20 FEBBRAIO 2019 SARA' ATTIVO PRESSO L'EX SCUOLA ELEMENTARE DI SAN NICOLA L'AMBULATORIO PER IL TRATTAMENTO DELLE PATOLOGIE NEURODEGENERATIVE LEGATE ALL'INVECCHIAMENTO. L'AMBULATORIO NON RAPPRESENTA SOLTANTO L'OPPORTUNITA' DI USUFRUIRE DI UN SERVIZIO NEL TERRITORIO COMUNALE MA E' ANCHE UN MOMENTO DI AGGREGAZIONE PER LA FASCIA DI PERSONE PIU' ANZIANA. PER MAGGIORI INFO CONTATTARE I RECAPITI IN LOCANDINA O L'ASSESSORE ALLE POLITICHE SOCIALI DEL COMUNE.